Crunchy cauliflower, refreshing fennel and tangy lemons make the perfect make ahead salad. I could not believe the explosion of flavors the first time I tried this fennel salad. As an added bonus, this salad can be kept refrigerated for a couple of days. So if you are like me and like to prep your food on the week end for the rest of the week, this is the perfect recipe for you. Before I show you how easy this salad comes together, I would like to share with you what has become one of my favorite kitchen tools. A short while ago, I received an opportunity to review the AnySharp knife sharpener. I had never heard of this product before so naturally I looked it up online. Let’s just say my curiosity was piqued. Well, I was and when I got my Any Sharp knife sharpener, I just had to test it out. As a butcher’s daughter, I would often be told by my dad about the importance of keeping your knives sharp. As strange as it might sound, a dull knife is more dangerous than a sharp knife… when properly handled of course! I attached my Any Sharp knife sharpener on my counter top, quite easily because of the suction cup. I then proceeded to sharpen a dull knife that I had in my kitchen drawer. Once I wiped clean my knife, I could not believe how thin I was able to slice my lemons; and it was totally effortless. I then proceeded to slice some tomatoes and once again, I was in total awe. The company refers to themselves as “The World’s Best Knife Sharpener” and based on my experience, I would have to agree with them. Needless to say, I was absolutely thrilled. I got a little carried away and sharpened a few more of my knives… and then I remembered the Best Ever Lemony Cauliflower Fennel Salad… let’s get started! Okay, so once your cauliflower and lemon have been perfectly sliced, place them in a non-reactive bowl. You can now proceed with the unconventional method of pouring boiling water over the cauliflower and lemon and allow to stand together for about 8 minutes. In the meanwhile, you can prepare the vinaigrette by simply shaking all of the ingredients together in a mason jar. 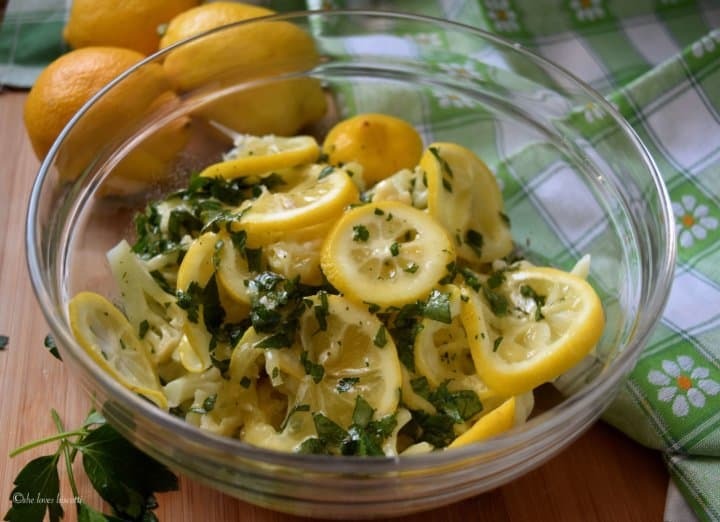 The vinaigrette ingredients include the usual culprits such as olive oil, vinegar, lemon juice, Italian parsley, oregano, dry mustard, garlic and of course salt and pepper. Drain the cauliflower and lemon and place in a mixing bowl. Add the rest of the salad ingredients except for the tomatoes. Add the tangy vinaigrette and toss everything together. Refrigerate for a couple of hours or up to 2 days in an airtight container. When ready to serve, just toss in the tomatoes. I prefer to serve this salad with a slotted spoon. Aren’t the bright colors of this fennel salad recipe just wonderful? I have been a big fan of Canadian Living Magazine ever since I was a teenager. I was a magazine subscriber for many decades and still to this day, a big fan of Elizabeth Baird, who was, of course one of the former food editors. As a result, I have countless cookbooks that she has authored. One such cookbook is “Vegetarian Dishes, Canadian Living’s best”, which was first published in 1997. I immediately fell in love with the simplicity, convenience and adaptability of this fennel salad recipe. I tweaked the ingredients of the vinaigrette to suit my families’ taste – feel free to do the same. The other change I made was the addition of green olives and fennel. I absolutely love the licorice flavor of fennel, especially in salads, when paired with citrus fruits (if you are looking for more fennel-inspiration, may I suggest this Refreshing Italian Fennel Citrus Salad or this Fregola Salad with Roasted Red Pepper). If you are not particularly fond of licorice (or raw fennel), may I suggest this grilled fennel recipe… you won’t believe the taste transformation. This Best Ever Lemony Cauliflower Fennel Salad is one of my go-to fennel salad recipes for potlucks or buffet parties… especially in the summer. Hopefully, you will enjoy it as much as I do. In a non-reactive bowl, pour boiling water over the cauliflower and lemon and allow to stand together for about 8 minutes. Meanwhile, combine all of the ingredients for the vinaigrette together in a mason jar. Set aside. 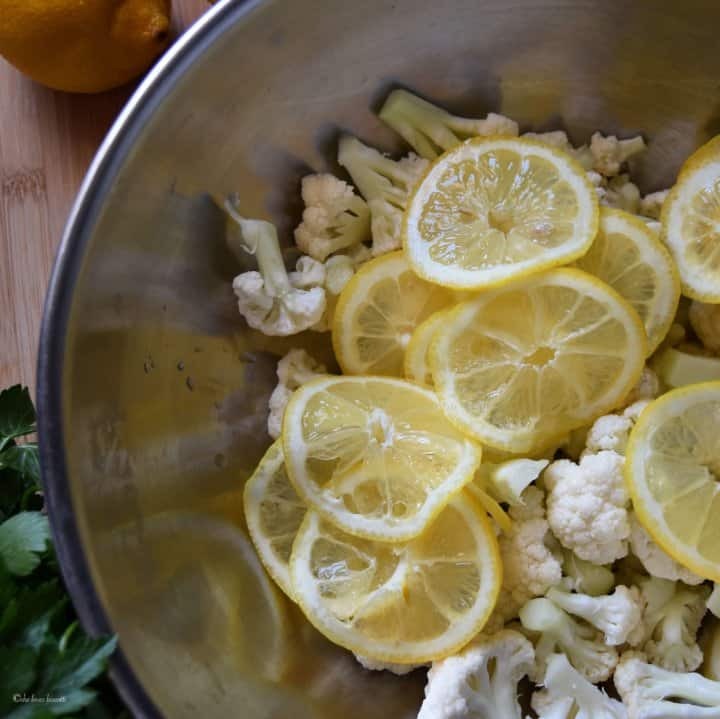 Drain water from cauliflower and lemons and place in a non-reactive mixing bowl. Pour the vinaigrette over the vegetables and toss everything together. Cover and refrigerate for a minimum of 2 hours or up to 2 days in an airtight container. Just before serving, add sliced tomatoes and toss together. There is an idle refrigeration time of 2 hours in order for the flavors to marinate. Disclosure: I have been provided with a complimentary AnySharp knife sharpener. I have not received any monetary compensation for this review. Views and opinions expressed in this post are entirely my own. DO YOU LOVE THIS CAULIFLOWER FENNEL SALAD RECIPE? Yummy! Always on the search for new salads, that are my go-to lunch almost every day. This is just lovely, plus I like everything lemon! 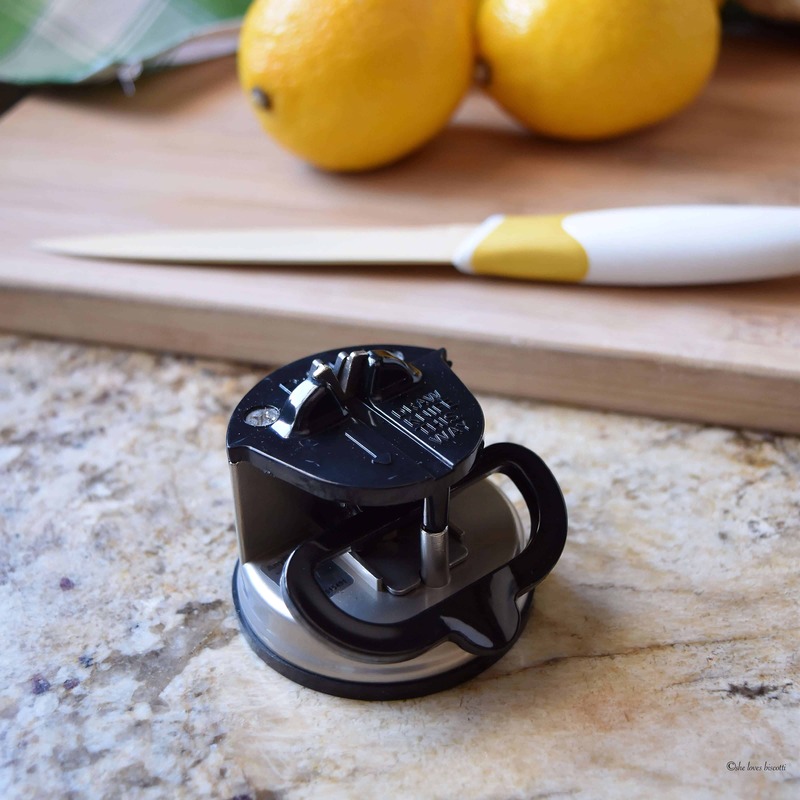 That sharpener is fantastic, it can really change your life in the kitchen! Love the recipe, exactly the type of think we enjoy. I generally stay away from home sharpening devices, but you have captured my interest and I intend to order one. Yes, a dull knife is one of the most dangerous tools in the kitchen but it difficult for most to understand this. Thank you for yet another informative and enjoyable post! Oh my gosh, Maria! Yum!! This sounds like a faster and easier version of homemade giardaniera! I honestly am not a big fan of salads (my parents always made a iceberg salad dressed with vegetable oil, white vinegar, salt and oregano … now I wonder how I used to eat that), but this salad sounds so delicious!! And that knife sharpner? AMAZING!!! Your post convinced me that I need to get one for myself. 🙂 I looked them up on Amazon (Germany) and they are not badly priced. Thanks for sharing your recipe and introducing me to Any Sharp knife sharpner! Never thought of using cauliflower as a salad! Tks for sharing, have a great day!??? ?